With the cancellation of the squad-based FPS Tiberium in 2008 – which would have involved the Scrin and the first time since Westwood’s Renegade that the franchise would to branch out into other genres – fans wondered when the next chapter would come out. Then on July 2009, EA announced the fourth official entry into the Tiberium universe. Officially titled Command and Conquer 4: Tiberian Twilight the following month, it was presented as the grand finale to the entire saga. 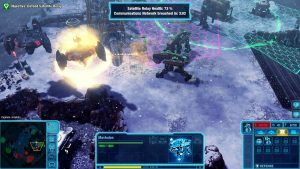 It’s also presented as a massive break from classic RTS convention, in a time when old-school mechanics were falling by the wayside. Even before the game’s release on March 2010, however, more than a few details were amiss with regards to what this all meant. It’s enough however to make more than a few long-time fans concerned. 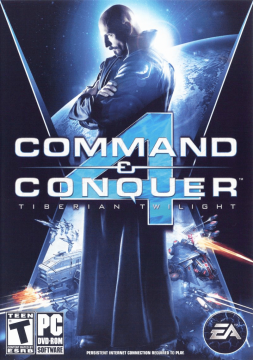 Thus, Tiberian Twilight came out to a fanbase and gaming community that was by and large shocked, to put it lightly. This became even more poignant when it became clear just how much the game not only bore little resemblance to its predecessors, but also to the point of derailing its storied pedigree. All while going above and beyond making players wonder whether the developers or EA knew what they were even doing. Set in 2077 (with the opening cutscene starting off in 2062), Tiberian Twilight takes place in the aftermath of Kane offering an (strained) alliance with GDI in exchange for access to the Tacitus and knowledge on containing Tiberium. The Tiberium Control Network or TCN that emerged from that collaboration has managed to undo the damage and infestation across much of the planet, but at the cost of stirring discontent among both GDI hardliners and even some of Kane’s own followers, with Nod separatists becoming a problem. What soon ensues is the Fourth Tiberium War (aka, the Ascension Conflict), with humanity’s future in the balance; all the while the so-called Messiah’s generations-long plans finally come to fruition. The premise alone can make anyone with even a passing knowledge of the lore pause. As it soon becomes evident that many if not all of the loose ends, cliffhangers and questions posed from Tiberium Wars, Kane’s Wrath and even all the way back to Tiberian Dawn were at best handwaved if not ignored. Aside from the Forgotten being reduced into little more than a passing caricature of their Westwood era portrayal, among the most glaring cases is how the Scrin, despite all hints to their eventual return, aren’t even playable, their presence non-existent save for what they left behind in the background. 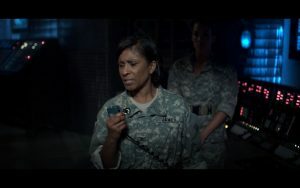 The campaign meant to convey said premise (which also has a co-op version) has you in the shoes of a crippled, faceless GDI commander named Parker (whose special implants are somehow tied to the Tacitus and TCN) as he finds himself embroiled in the conflict, eventually being forced to choose between remaining with GDI and joining Kane and his Nod loyalists. Even setting aside the continuity-breaking and out-of-character antics of just about everyone (with Kane’s open willingness to ally with GDI being the tip of the iceberg), the delivery comes across almost as an afterthought, being either patronizing or dull. The FMVs meanwhile manage to seem cheaper than Westwood’s low-budget efforts in the mid-90s while falling flat in their attempts to be fully taken seriously; not even Joseph Kucan’s acting could save poor quality. Then there’s the storyline itself, which further drives home the rushed aspects of the whole affair, with the war even happening over the course of a few days. Then it tries to close the entire series – as well as reveal Kane’s true purpose – on an insultingly lazy note rather than just a whimper, seemingly with little care for what’s said to be the culmination of a long-running saga. The presentation doesn’t particular help Tiberian Twilight’s case, either. 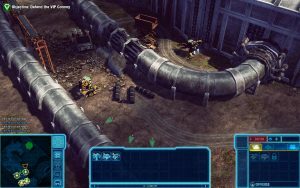 Graphics-wise, the game utilizes the SAGE engine, which by that point was clearly showing its age, with seemingly little done to alleviate that. Despite the somewhat sharper models and brighter tones, it manages to look like a downgrade from Tiberium Wars, with bland textures and rather lifeless environments for what’s supposed to be a recovering Earth. 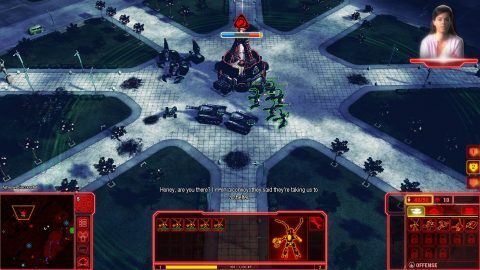 There’s also an inconsistent yet bizarre art shift present, be it in the heavy cursor highlights straight out of Red Alert 3 or how some structures and units (especially blatant in the case of infantry) are redesigned to look more cartoonish in contrast to previous Tiberium works; in addition to further emphasizing the dated graphics, it comes off as an ill-fated attempt to make them stand out better in online play. 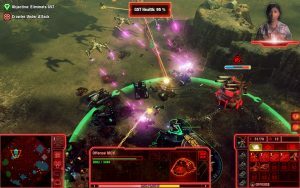 Add in uglier particle effects – with the decision to go heavy on lasers and brightly-colored weaponry making the atmosphere much more detached from the more grounded, grittier nature of even Tiberian Sun – and a generic sci-fi soundtrack and you’re left with a work that may as well be Command in Conquer in name only. In terms of gameplay, it manages to be even more of a disappointment. Virtually everything that made the franchise distinct is either gone or warped beyond recognition, in the process becoming much more Real Time Tactics than RTS. 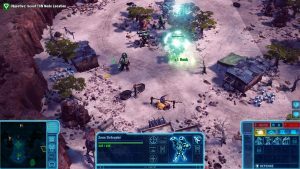 In place of base-building (aside from a handful of defensive structures), there are different “classes” of Crawlers (special mobile bases that can produce a selection of units depending on class) that players can choose from and deploy anywhere. 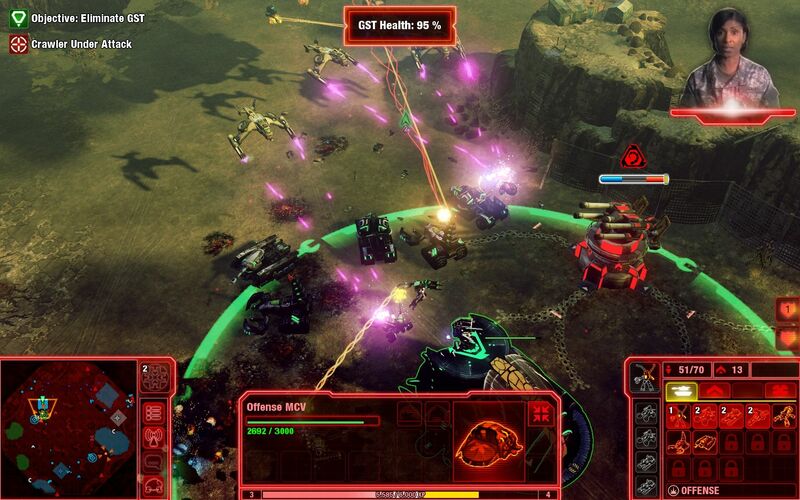 While in the absence of resource gathering, there are TCN Nodes that serve as control points to be fought over ala Dawn of War or World in Conflict for “Victory Points.” At the same time, there are population caps for each Crawler that (regardless of upgrades) severely restrains the number of troops and vehicles that can be fielded, effectively removing the possibility of large-scale battles seen in earlier games; this also results in players being forced to make do with a handful of troops with little flexibility to respond to various threats. In addition, be it skirmish or multiplayer, you start out with an even more limited lineup of units and abilities on hand; the rest are unlocked by leveling up after tediously grinding against opponents who don’t necessarily have such handicaps. Coupled with pathfinding issues and half-baked AI, it all means that there are far fewer options available for actual strategies, with matches being horrendously unbalanced if not a barely playable slog. Combined with a counterintuitive, anti-consumer DRM system that requires a constant Internet connection (even for single-player content), it’s no wonder, then that Tiberian Twilight received mixed reviews. Tellingly, even those reviewers who tried to defend the massive changes couldn’t ignore the flaws. As if to add more insult to injury (or perhaps karmic justice), by the end of 2010 whatever hopes the company still had of taking the lead in its “RTS as a sport” push would be dashed with the release of Blizzard’s Starcraft 2; this is to say nothing of the growing popularity of MOBAs over classic-style RTS games. It wouldn’t be until 2013 though, when the planned Generals 2 was cancelled as a consequence of similar corporate shenanigans, that the franchise would fall into an indefinite limbo. 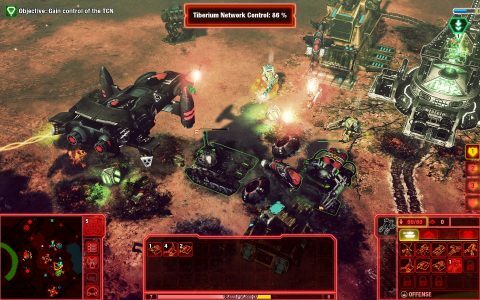 Outside of the browser-based Tiberium Alliances, it seems as though it’s become yet another neglected piece in EA’s portfolio, its lessons ignored. For fans and RTS gamers alike, however, it’s all but a given that the game quickly gained nigh-universal notoriety as the worst Command and Conquer entry ever. Worthy as it was of the ignoble brand of “franchise killer,” that it was neither deserving of the name Tiberian Twilight nor remotely close to what Westwood envisioned didn’t help matters. Adding further to the simmering bitterness and melancholy were the myriad revelations leading up, during and after its release. 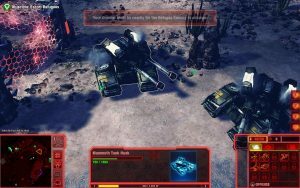 About a year prior to the announcement, a competitive multiplayer-only project titled Command and Conquer: Arena (originally aimed at the Asian market as a spin-off of Tiberium Wars) had been in the works before being cancelled and was never publicly announced; surviving footage suggests that it would have also included microtransactions. According to former EALA employee Greg Black in an interview with GameReplays.org in 2010, this project was never intended to be a canonical Command and Conquer work at all, but rather an experiment. Said interview, however, also revealed that some executives thought that it made “the most business sense” to exploit the cancelled production, slap on a single-player campaign, make it a canonical Tiberium entry and call it day, with EALA having no choice but to go along despite objections. 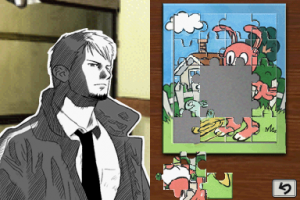 This is saying nothing of how there are some glimmers of what might have been, given more time and creative control, such as Joseph Kucan’s efforts to salvage the story through his last performance as Kane, the solid voice acting at points and some of the updated unit designs, which would have shone in a better game. Whether it’s seen as a betrayal or a tragedy, it’s telling how even now, most would rather pretend that it never happened. Sufficed to say, for more than a few it seems as though the Tiberium saga may as well have ended with the third entry, a constant reminder of what the series used to be and the lost potential for something more. But on a similar note to Generals, the fans haven’t been idle. In the years since its release, the modding community has created new works from the foundations of the old.